Komodo’s intelligent and results- driven evaluations have also proven extremely effective in practice and are reflected in the engine’s playing style. If Komodo 10 considers its position to be advantageous, it avoids exchanges and seeks to open the position, but when defending a worse position, it strives to exchange pieces and block the position, in an attempt to push the game towards a draw. The new number one has arrived! Thanks to a host of extensive improvements and fine tweaking, the latest version of Komodo has again gained over 60 Elo points on its predecessor. The changes cover several areas: the evaluation function has been significantly sharpened, particularly with respect to king safety and endgame positions, and the search algorithm has been improved and optimized to run on multiple processors. Komodo 10 is also better at managing its time, and just generally calculates faster. The result is an unbeatable combination - the strongest chess engine ever running on the best and most popular user interface around. As it comes with the Fritz 15 GUI,Komodo, as well as chess prowess, offers all the training and playing functions you know from Fritz, including direct access to the Chess- Base Web Apps such as Live Database, the ChessBase video portal, our tactics server and more! It also recently demonstrated its exceptional playing strength in a series of matches against grandmasters, including the current world #6, Hikaru Nakamura. 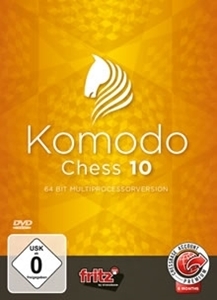 Komodo remained unbeaten in over 50 games in which it gave its human opponents a material advantage or several free moves (with the exception of only a few games in which the handicap consisted of two important pawns or the f7 pawn and three free moves) - Komodo even beat Nakamura 2.5 to 1.5! This ultra-strong engine has won three of the last four TCEC championships, making it a multiple winner of the most prestigious prize in computer chess. What is more, at tournament time controls, Komodo is #1 in the majority of rating lists.